It's been almost a month since I finished my A-levels, and now that I've had some time to relax and spent some time away from home, I think I'm ready to move on, despite the fact I don't know exactly what I'm moving on to – I'm just going to have to jump and grow my wings on the way down. It's a somewhat scary prospect, but ultimately it's what we're all doing. 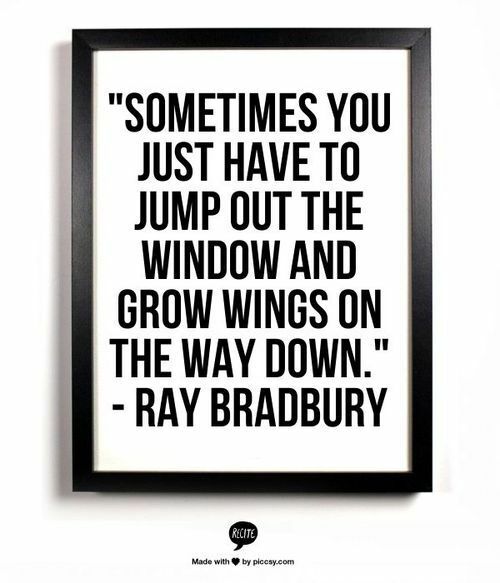 I hear about people who have plans to go to university or to do an apprenticeship or start a specific career, and I worry that I should have more of a plan, but ultimately those people are jumping out of the window without wings, too - they just know the target they're aiming for. No matter how thoroughly we work on them, plans can change at any given moment, and just when we've sprouted a little pair of downy wings we find ourselves having to grow another set in order to adapt to a new situation. As someone who has a tendency to feel totally thrown off when plans change, particularly at short-notice, this ability to grow wings is something I want to work on, so that I no longer need to plan everything to the nth degree and am free to dive into the unknown, into the future, confident in my ability to grow wings strong enough to carry me wherever I choose to go and get me there safe and sound. Being wing-less is daunting, and there is doubt in the back of my mind that I'm going to fall rather than fly, but there is also every possibility that I will fly, and I'd rather take that chance than sit by the window, too scared to even try.